Carolyn and Sean Savage were in the news several months ago, because of a heart breaking mistake. They underwent IVF treatment, and the embryos of another couple were implanted instead of theirs. You can read about their story here. Well it turns out that they are Catholic, and surprise surprise they disagree with the Church’s teaching prohibiting IVF. Sean has written a post for the CNN religion blog refuting the Church’s position.. Frankly his post demonstrates that he really doesn’t understand why the Church insists that IVF is always morally wrong. His argument is , “we want a big family and IVF is the only way to make that possible”. He doesn’t realize that children are gifts from God and not products. We are not guaranteed the right to children. Certainly infertility is a cause of great suffering. It is not something that should be taken lightly. But as Christians we are called to embrace our suffering. 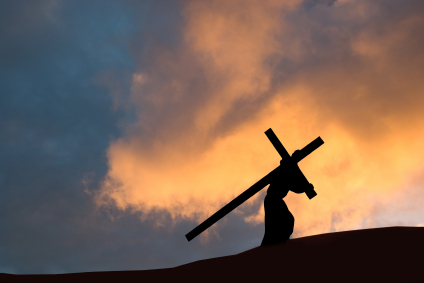 Jesus told us to pick up our cross and follow him. We are not called to find a way around the cross. Yes this a hard teaching. Sometimes we are given the thorns without the rose. My favorite deacon (MFD) and I are blessed with two children and five grandchildren. So what do I know? Amen. Man I wish that I had such faith, fortitude, and insight at her young age. This entry was posted in Catholic Moral Teaching, Marriage, Moral Theology, Suffering, Uncategorized and tagged Infertility and Catholic Church teaching, redemptive suffering. Bookmark the permalink.